“No one is free until we all are free.” – Dr. Martin Luther King, Jr. Following the success of her Death Row protest piece, the ‘Tiki Love Truck’, extreme craftivist and renegade potter Carrie Reichardt has turned her talents to another subject. The meticulously crafted mosaic Zulu Taxi cab is beautiful, sure. But beneath the gloriously glazed tiles and tessellated trunk lies a much deeper meaning. This particular taxi cab is designed for a man named Kenny ‘Zulu’ Whitmore, a former member of the Black Panther party — a revolutionary nationalist and socialist US-based group — and political prisoner who has been in Louisiana State Prison, in solitary confinement, for forty years. Forty years in solitary is enough to break the spirit of any human being, especially if the grounds on which your freedom has been robbed are shaky, and widely contested. Despite all of this Zulu continues to fight for his right to freedom. Carrie and her collective of London based artists, The Treatment Rooms, have joined that fight. In this interview Carrie reveals what drives the creation of her political art, and discusses the deeper significance of the remarkable Zulu Taxi. How did you get involved in Kenny ‘Zulu’ Whitmore’s case? I got involved with Herman Wallace (another Black Pantherpolitical prisoner), as I’ve been writing to people on death row since 2000. Herman had a strong international campaign behind him; Zulu was in the cell next door and he had nobody. Herman wrote to his European supporters and asked them to come together. So in 2007 we decided that we would launch a campaign and I started writing to Zulu. What inspired you to create the taxi? When you read about the Black Panther party, you understand revolutionary ways of collective action. The Panthers were a unifying force that stood up to the system that oppressed them, which now seems even more pertinent than ever. The Treatment Rooms collective found it amazingly inspirational to read about these concepts and understand how you could affect change on a local level. The whole story is amazing because they’re political prisoners, and we don’t ever hear about them. It’s horrendous and no one really knows about it. In Louisiana State Prison, where Zulu is, the average prison sentence is 80 years. The system really is insane. Zulu is an incredible revolutionary who sends the most wonderful letters. He’s fighting a cause and a system, but fighting it from the belly of the beast. What is it about art, and mosaic in particular that is so effective in challenging people’s perspectives? I have a real belief in the power of clay, and an innate love of it. People love ceramics and tiles because it is the earth. It is the most poopular medium there is, but it’s the most derided by the art establishment. The ‘art car’ is probably the most popular thing you can do, because art can sometimes be intimidating. People don’t like going to art galleries because they find it intimidating to see pictures on walls. Street art has made it more democratic to a degree, but do something to your car and everyone will talk about it, because everyone will feel like they can. At the festival you’re planning on getting Shambalans to write letters to Zulu. What are you hoping to achieve through those letters? It makes it really personal: a connective postcard. You don’t have to write your name and address, you just write a postcard saying; “thinking of you”, “I’ve heard of you”. It’s making a personal connection straight away between Zulu and somebody. But more importantly it’s hugely symbolic because everytime Zulu gets a letter the prison are aware that more and more people are behind his fight. It’s getting letters that enable him to stay mentally strong. And I think that’s really powerful – both for the person who sends the letter and for Zulu, who receives it. That’s how you make these personal connections; that’s how movements grow. What does Zulu’s taxi represent? 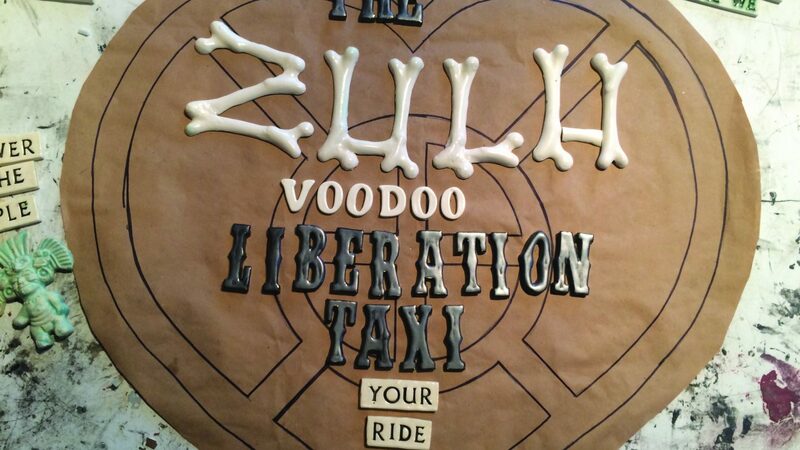 Zulu said in his most recent letter, “what more could you want other than your freedom?” Zulu understands that this taxi is a symbol. He wants people to hear of the injustice taking place, because it’s not just about him, he’s just a figurehead of a much wider problem. The entire system is flawed. People don’t really want to know about this stuff — they don’t feel like they can do much about it. But if you create the most amazing art car that everybody wants to come and look at, then at least that opens up a dialogue. The Taxi is taking months to make and so many people will have touched and worked on this. It sends a symbol to him that people are behind him. I’ve had stuff sent to me from all over; New Zealand to the Netherlands — this is an international thing. Carrie’s Zulu Taxi will be exhibited in the green fields of Shambala this year, where she will also be running various workshops. Check it out and let creativity inspire you to collective action!